I know it’s been about a week since you have heard from me, so I hope I haven’t lost your interest in following my renovation project! 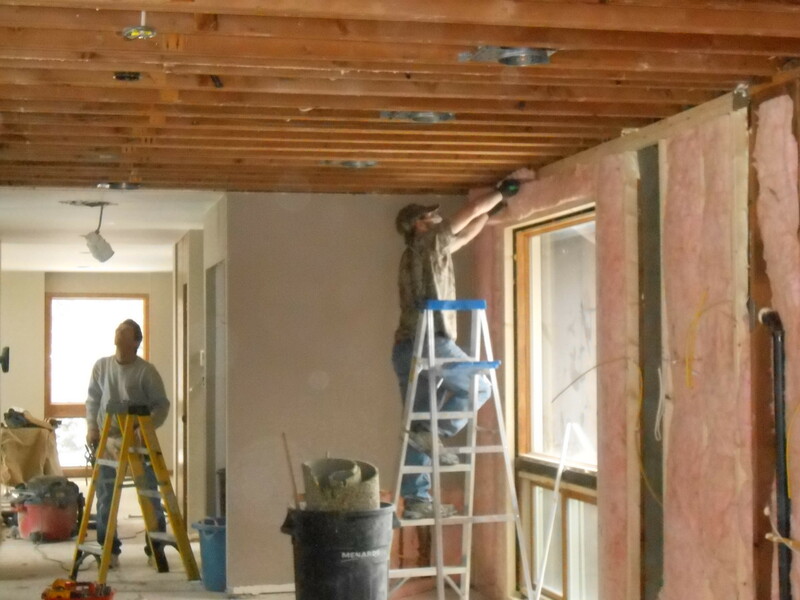 You haven’t missed much, as there was a delay (three days) in getting the city inspectors into the house to sign off on the preliminary work of the plumbers, electricians, and the heating/cooling guy. So it has been a quiet week. 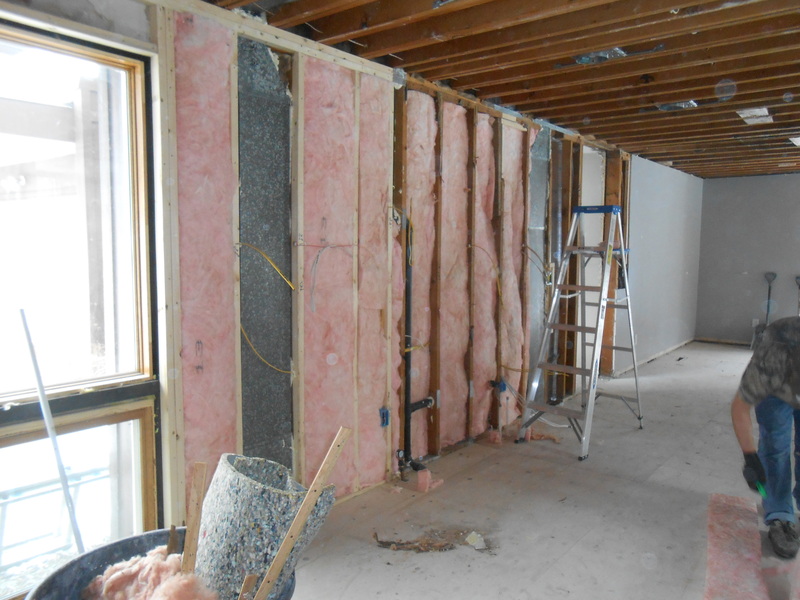 With the inspections complete, the exposed walls were insulated, and prepped for the sheetrock. That’s what was happening when I popped in this afternoon. Mark, the head electrician on the project, was back for a few more adjustments. Decided to lose a couple of lighting cans (some that were just wired last week) in the new space and a few more old ones in the entry and under the loft in the living room. I thought a low profile ceiling light would be a much better look for the entry. The placement of the cans and other ceiling fixtures has been a bit tricky. John (architect) drew up a lighting plan, and there were a few things obstructing the exact spots specified, so there was some fudging of the plan, and I got talked into adding more cans by Mark and Jay (builder). Over the weekend I came to the conclusion that I didn’t like the extras. The ceiling was getting cluttered, some cans were too close to others of another zone, and I didn’t like the “close, but not quite” alignment of the cans and my future pendants. I know Mark and Jay are skeptical, thinking I will want more light, but John is not concerned. I think I will be happy with a cleaner looking ceiling, and my white cabinets, counters, and walls will bounce the light around adequately. We will see (maybe not very well) who had the better advice when the kitchen is complete! Mark removing one of 2 existing canned lights from the entry. 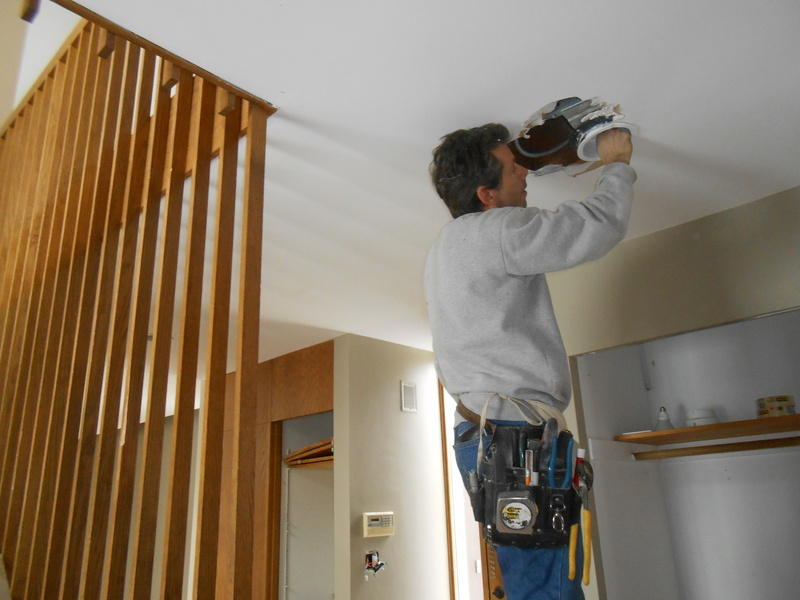 John has suggested an awesome fixture for this space! I thought I was going to be purchasing my cabinets on my last (2nd) visit to Ikea two weeks ago. No, ikea explained, better to purchase when you are two weeks out from the install date. So, John and I spent some time going over the plan, making a few adjustments, and left. Yesterday, I was back. We are roughly two weeks from our target install date, and I was ready and excited to make the purchase. I approached a nice Ikea employee in the kitchen planning department, and we went over the entire project together. John had done a great job drawing the kitchen cabinet design using the ikea software, so there wasn’t much to change. Although, it was comforting to have it all double checked! 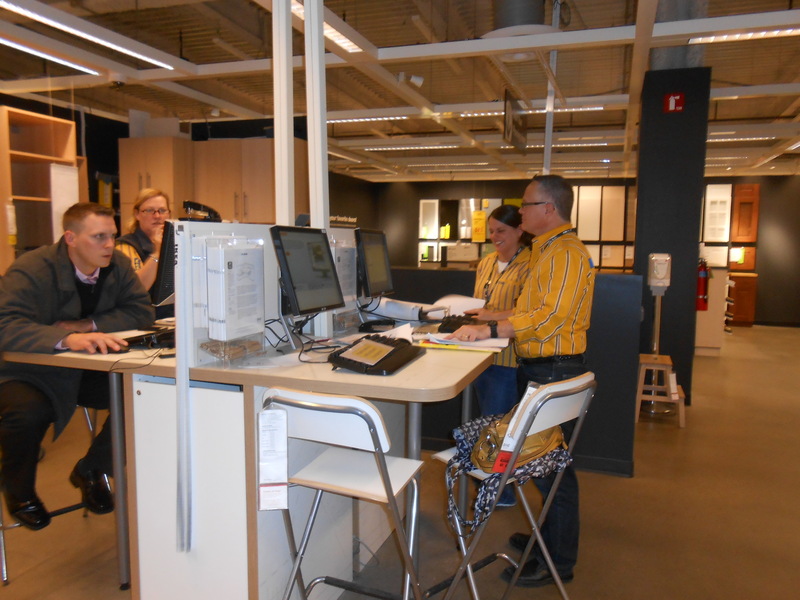 Ikea’s kitchen planning department. I know it too well! From what I understood (it’s still just a bit fuzzy), I just need to bring my cabinet “shopping list” back, and we will be ready to rock. Set the date for delivery, which could be as soon as the next day, and pay. Done! We are saving our builder Jay (who normally builds custom kitchens) the headache of assembling the cabinets and installing them, by having ikea arrange that work for us. This was Jay’s idea. Our kitchen will arrive in 246 packages, and unless you do it often, putting ikea stuff together can be more than challenging! The assembly/install portion is done by a local independent contractor who does ikea kitchens exclusively, so I think it is definitely the way to go. Now, if scheduling that work has as many restrictions and is as confusing as the cabinet purchase, it may be a few days before I know what’s up. Thanks for the great blog. I also live in the Twin Cities and am going to be going with Ikea cabinets for my kitchen. I was wondering if you would mind sharing who you used for your cabinet install. I am having a hard time finding anyone decent who is willing to touch Ikea! So sorry for the delayed response… We used John Johnson whose company is called Revival Interiors. Found him on CL, but he now has a website with info. Good luck!